Naima Joseph is an HQSS researcher, attending physician in obstetrics and gynecology at Massachusetts General Hospital and Brigham & Women’s Global Women’s Health Fellow. She has been working with the Mbarara Regional Referral Hospital in Uganda on cervical cancer screening availability and quality. Here, she shares some reflections on quality of care from her recent trip. 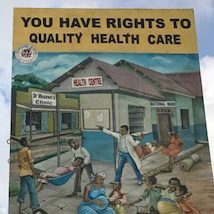 The sign is a reminder that there is a work to do in terms of improving Uganda’s health system and maximizing population health. Despite record investment over the past ten years, Uganda’s health care performance is ranked 149th out of 191 nations by the WHO. While investments have prioritized communicable diseases, such as HIV, TB, Malaria, and maternal disorders, deaths from noncommunicable diseases (NCDs) have increased by almost 50% in the past 10 years. The probability of dying between ages 30 and 70 from the four main NCDs (cardiovascular disease, cancer, diabetes, chronic respiratory disease) is 21%. The government may recognize the right of its people to quality health care, but has yet to develop a multi-sectoral coordinated response, protocol, or policy, around prevention and management. That doesn’t mean community interest is lacking. Locals in Nykabare, a parish in the south-west district of Mbarara, will freely discuss their concerns. Top concern? Food security. Health, a close second. To that end, community leaders have engaged the local health center and tertiary referral hospital to meet their needs, specifically requesting not just HIV screening, but screening for NCDs. As an obstetrician-gynecologist at Massachusetts General Hospital, and a Brigham & Women’s Global Women’s Health Fellow, I have been working with the Department of Gynecaelogy and Obstetrics of Mbarara Regional Referral Hospital (MRRH), to meet the demands of its surrounding catchment, namely improving cervical cancer screening availability and quality. Indeed, cervical cancer is entirely preventable, but it is the leading cause of cancer related deaths among females in Uganda. A 2014 survey by the Uganda Cancer Institute revealed that only 30% of women had ever received cervical cancer screening and that less than 70% had completed appropriate follow up. Almost all cases of cervical cancer can be prevented with early diagnosis of premalignant lesions followed by treatment of those lesions; however, in Uganda, many women are inappropriately screened by either conventional cytology-based screens or visual inspection with acetic acid (VIA). Screening is only effective if women are screened appropriately and if screen positive women receive treatment of precancerous disease. Dr. Mayanja and Nurse Alexcer offer their own clinical insights for inadequate screening: women’s fear of pelvic exams, women’s inability to access and pay for screening at health center clinics, and provider errors in screening. 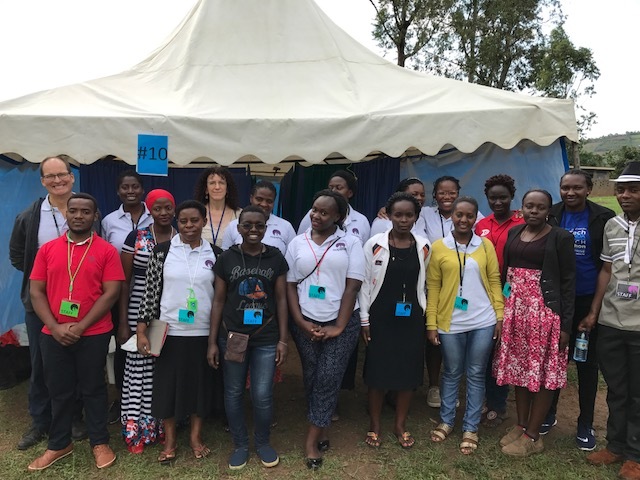 However, these passionate providers believe more can be done to improve the quality of cervical cancer screening and are working with our team to launch self-sampled high-risk human papillomavirus (hrHPV) testing for screening. HrHPV testing has been recommended by the WHO as a preferred screening strategy when feasible: it is more sensitive than cytology, has a higher negative predictive value for precancerous lesions than cytology and VIA, has less inter-observer variability than VIA, and has a favorable cost-effectiveness profile versus cytology or VIA. However, there is limited experience on implementation of hrHPV self-screening in LMICs, and an important unanswered question for the field is whether self-sampling hrHPV testing can meaningfully improve access to cervical cancer screening. Therefore, we are piloting hrHPV self-testing in the community and implementing mobile a phone-based results notification system to facilitate follow up treatment at MRRH. We are hopeful that this study will bring innovative approaches to rural communities through health fairs, and use existing technologies, namely cell phones, to improve linkage to care for clinical follow up in women who otherwise do not access the health system.